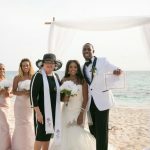 When this cruise vacationer from Arlington, Texas contacted me to do a wedding vow renewal he emphasised that it was a surprise for his wife of 5 years. 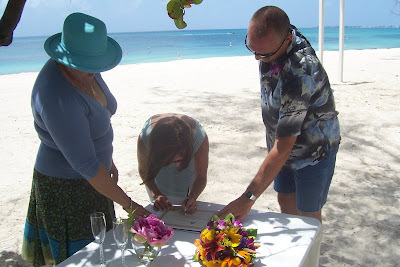 We did all the planning secretly, and even when my husband and I met them we kept up the charade of friends meeting friends. We took them to the Governor's Beach, which right after Gustav was pristine, and also deserted. 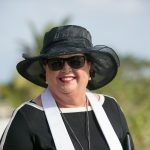 I thought it was very thoughtful that J and his mother-in-law bought the dress his wife is wearing below, and he smuggled it on board the cruise ship and then asked her to wear it when they came ashore in Cayman. It was the perfect choice for the day and the occasion! Joy (yes, we have the same name!) 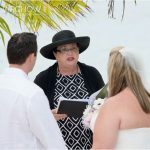 said she knew something was up, but she didn't know what even after I handed her the 'tropical' bouquet. 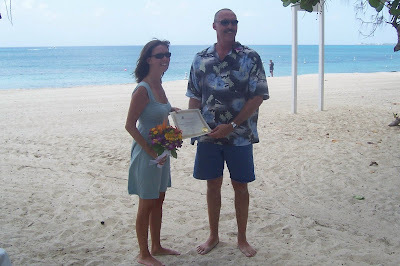 J took her for a little walk on the beach while we set up for the ceremony and signing of the Renewal Certificate. This is my favourite spot at the Governor's Beach, and we had it to ourselves. A big hug from a very happy lady. 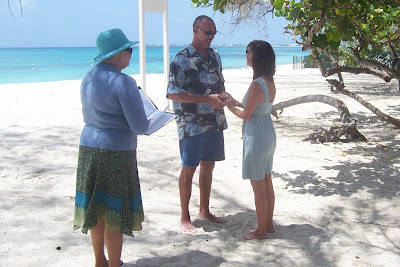 After the ceremony they went off to enjoy the rest of the morning at Boatswains Beach. This was a very special and happy occasion. 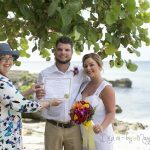 I did a special reading for the couple called "Two Hearts -One Love" because I wanted them to have very happy and lasting memories of Cayman. Let your marriage be a potpourri of your love. Gather each special moment as it comes, and carefully preserve it in your heart. Savour the good times, so you will be strengthened when the clouds hide the sun. Appreciate your togetherness, even when apart, and rejoice in your oneness. Make time for each other; it is a wise investment in your happiness. For there is none other quite the same. They ensure a lasting quality to your love. Replenish it often with kind words and understanding hearts. And may every day become a beautiful memory.